Over the last three years, the MIT Physics Department has been introducing major changes in the way that freshman physics is taught through the Technology Enhanced Active Learning Project. TEAL is an “interactive engagement” approach which merges lectures, recitations, and desktop laboratory experiments. Why is the department moving to this model for teaching introductory physics? First, the traditional lecture/recitation format for teaching 8.01 (Physics I) and 8.02 (Physics II) has had a 40-50 percent attendance rate, even with spectacularly good lecturers -- Walter Lewin, for example -- and a 10% or higher failure rate. Second, there have been a range of educational innovations for teaching freshman physics at universities other than MIT over the last few decades that demonstrate that using “interactive engagement” methods results in higher learning gains as compared to the traditional lecture format. Finally, the mainline introductory physics courses at MIT have not had a laboratory component for many years, which is a major disadvantage when teaching physics. In the TEAL d’Arbeloff Classroom, students work at tables in assigned groups of three. Grades in the course are not curved, to encourage students with stronger backgrounds to help students with weaker backgrounds. A student who consistently does not attend class cannot get an A. This is because in our judgment: (1) the phenomena under study must be experienced first hand and (2) part of the reason for the traditionally high failure rates in 8.02 is the lack of student engagement with the course. We have had a robust assessment and evaluation effort underway since the inception of the TEAL project, under the leadership of Professor Judy Yehudit Dori, a faculty member in the Department of Education in Technology and Science at the Technion in Hafia, Israel. We use a variety of assessment techniques, including the traditional in-class exams, focus groups, questionnaires, and pre- and post- course testing. Based on the pre- and post-testing, the learning gains in 8.02 last spring by standard assessment measures were about twice those in the traditional lecture/recitation format. The fact that interactive engagement teaching methods produce about twice the average normalized learning gains when compared to traditional instruction replicates the results of many studies at other universities, including Harvard. These results are also consistent with the feeling of the physics faculty teaching the course that students were learning more with this method of instruction, and with the much lower failure rates for spring 2003 8.02 (a few percent) compared to 8.02 failure rates in recent years (from 7 percent to 13 percent). In contrast to this overall increase in learning gains, student satisfaction with the spring 2003 course was mixed to negative. The Course Evaluation Guide overall course score for spring 2003 was 3.7 out of 7.0, a very low ranking. Why was this? In hindsight, we made a number of missteps in the transition from prototype to the regular class in spring 2003. For example, almost all of our students in the prototype courses had seen the material before at some level, either because they had not done well in physics in their freshman year (two-thirds of the students), or because they were freshmen with excellent physics backgrounds (one-third of the students). This was not the case in spring 2003, when many students entering the course had never seen the material before. Moreover, we use group work extensively in class, and in the prototype courses we grouped according to background; that is, every group had a range of prior knowledge based on the pre-test. In spring 2003, however, we simply assigned students to groups randomly, for efficiency. The result of these two factors was that some of our groups in spring 2003 consisted entirely of students who had never seen the material before. Thus, a frequent student complaint in our focus groups was that “the blind can’t lead the blind” in group work. Another factor in spring 2003 was that the sections were led by faculty who had not taught in this format before. Although we did train the faculty in the teaching methods in the course, in hindsight our training was not thorough enough to prepare them for the new environment in the d’Arbeloff classroom, both in terms of the technology in the room and the teaching methods used in “interactive engagement.” In particular, we provided to the teaching staff Powerpoint presentations for the material to be covered in a given class, and many students felt that the section leaders went through this material too rapidly. They preferred more traditional boardwork, which moderates the pace of the presentation of material. Students complained that they felt they did most of their learning outside class, and only came to class because they knew class participation was part of their grade. Finally, we did not do enough training of the student groups themselves in collaborative work. Ideally, collaborative work is a positive experience for everyone in the group -- the students with weaker physics backgrounds can learn from more advanced peers who have recently struggled with the same concepts, and the students who have stronger backgrounds find that the best way to solidify one’s own understanding of the material is to explain it to others. We did not do a good job of setting out the mechanics of group work, and in particular we did not set up mechanisms for corrective action for groups that were not working. For TEAL to succeed in the long term, it is crucial that we correct the missteps from spring 2003. Since we feel that class attendance is a central part of this teaching method, we must structure the course so that coming to class is seen by students as a profitable use of their time. The changes we are making in fall 2003 are: (1) heterogeneous grouping; (2) more extensive training for course teaching staff, both section leaders and graduate and undergraduate TAs; (3) an increase in course teaching staff, as students felt we were understaffed during class; (4) fewer experiments that are better explained and better integrated into the course material; (5) better planning of individual classes to break our active learning sessions into smaller units that can be more closely overseen by the teaching staff. The lessons of the TEAL experience thus far for educational innovation at the Institute are, first, that any serious educational reform effort at MIT must be accompanied by a robust assessment effort. One needs some quantitative measure of the effectiveness of instruction to gauge whether any innovation is actually producing results that are superior to or equal to what it is replacing. Also, with hindsight we feel that our major misstep in this transition was not training course personnel and students adequately to prepare them for this new method of teaching. This is a condensed version of an article that appeared in the MIT Faculty Newsletter, Vol. XVI No. 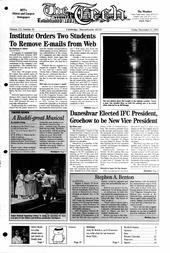 2, Oct.-Nov. 2003, online at http://web.mit.edu/fnl/. John W. Belcher is a professor of physics and principal investigator of the TEAL project.